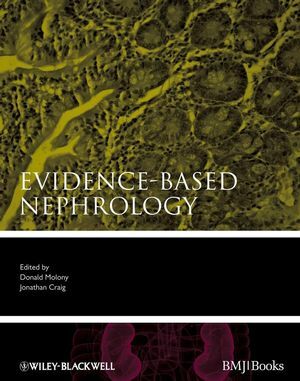 This book covers the management of all major renal diseases from an evidence-based and patient-centred approach. With contributions from leading international experts who have a real understanding of evidence-based medicine it provides recommendations on treatment regimens to adopt for individual patients that are most strongly supported by the evidence. PART 1 EPIDEMIOLOGY OF KIDNEY DISEASE AND EVIDENCE-BASED MEDICINE. 1 Epidemiology of chronic kidney disease. William M. McClellan & Friedrich K. Port . 2 Chronic disease surveillance and chronic kidney disease. Diane L. Frankenfield & Michael V. Rocco . 3 Risk factors for progression of chronic kidney disease. Eberhard Ritz, Danilo Fliser & Marcin Adamczak. 4 Epidemiology and screening for chronic kidney disease. Sylvia Paz B. Ramirez . 5 Prediction of risk and prognosis: decision support for diagnosis and management of chronic kidney disease. Benedicte Stengel, Marc Friossart & Jerome Rossert . PART 2 ACUTE KIDNEY INJURY. 6 Definition, classification, and epidemiology of acute kidney injury. Eric A. J. Hoste, Ramesh Venkatamaran, & John A. Kellum . 7 Pre-renal failure and obstructive diseases. Andrés Cárdenas & Pere Ginès. Jay L. Koyner & Patrick T. Murray. Brendan J. Barrett & Patrick S. Parfrey . 11 Miscellaneous etiologies of acute kidney injury. Kamalanathan K. Sambandam & Anitha Vijayan . 12 Renal replacement therapy in acute kidney injury. Steven D. Weisbord & Paul M. Palevsky . 13 Management of idiopathic nephrotic syndrome in adults: Minimal change disease and focal segmental glomerulosclerosis. Fernando C. Fervenza & Daniel C. Cattran . 15 IgA nephropathy in adults and children. Jonathan Barratt, John Feehally & Ronald Hogg . PART 4 SECONDARY DISEASE OF THE KIDNEY. 17 Hypertension: classification and diagnosis. Bernardo Rodriguez-Iturbe & Crispin Marin Villalobos . 18 Management of essential hypertension. Eberhard Ritz, Danilo Fliser & Marcin Adamczak . 19 Management of hypertension in chronic kidney disease. Aimun Ahmed, Fairol H. Ibrahim & Meguid El Nahas . 20 Diagnosis and management of renovascular disease. Piero Ruggenenti & Giuseppe Remuzzi . Arrigo Schieppati, Erica Daina & Giuseppe Remuzzi . Monique E. Cho & Jeffrey B. Kopp . M. Aamire Ali, Scott D. Cohen & Paul L. Kimmel . 25 Infection-related nephropathies: Hepatitis C virus. Dirk R. J. Kuypers . Fabrizio Gievri & Hans H. Hirsch. 27 Toxic nephropathies: Nonsteroidal anti-inflammatory drugs. Wai Y. Tse & Dwomoa Adu. 28 Toxic nephropathies: Environmental agents and metals. 29 The kidney in pregnancy. Phyllis August & Tiina Podymow . PART 5 CHRONIC KIDNEY DISEASE - CHRONIC RENAL FAILURE. 30 Progression of chronic kidney disease: diagnosis and management. Anil K. Agarwal, Nabil Haddad & Lee A. Hebert . 31 Treatment of anemia in chronic kidney disease, stage 3-5. 32 Dyslipidemia in chronic kidney disease. Vera Krane & Christoph Wanner . 33 Chronic kidney disease and hypertension. Sangeetha Satyan & Rajiv Agarwal . 34 Recognition and management of mineral and bone disorder of chronic kidney disease and end-stage renal disease. Mark G. Parker & Jonathan Himmelfarb . PART 6 CHRONIC KIDNEY DISEASE STAGE 5 - HEMODIALYSIS. 36 When to start dialysis and whether the first treatment should be an extracorporeal therapy or peritoneal dialysis. 37 Modalities of extracorporeal therapy: hemodialysis, hemofiltration and hemodiafiltration. Kannaiyan S. Rabindranath & Norman Muirhead . 38 Dialysis delivery and adequacy. Peter Kotanko, Nathan W. Levin & Frank Gotch . 39 General management of the hemodialysis patient. Robert Mactier & David C. Wheeler . Behdad Afzali & David J.A Goldsmith . 41 Non-access-related nosocomial infections in hemodialysis. Brett W. Stephens & Donald A. Molony . 42 Vascular access for hemodialysis. PART 7 CHRONIC KIDNEY DISEASE STAGE 5 - PERITONEAL DIALYSIS. 43 Selection of peritoneal dialysis as renal replacement therapy. Norbert Lameire, Raymond Vanholder & Wim Van Biesen . 44 Small solute clearances in peritoneal dialysis as renal replacement therapy. Sharon J. Nessim & Joanne M. Bargman . 45 Salt and water balance in peritoneal dialysis. Cheuk-Chun Szeto & Philip Kam-Tao Li . 46 Impact of peritoneal dialysis solutions on outcomes. David W. Johnson & John D. Williams . 47 Prevention and treatment of peritoneal dialysis-related infections. Giovanni F. M. Strippoli, Kathryn J. Wiggins, David W. Johnson, Sankar Navaneethan, Giovanni Cancarini & Jonathan C. Craig . 48 Evaluation and selection of the kidney transplant candidate. 49 Evaluation and selection of the living kidney donor. 50 Predictors of transplant outcomes. Krista L. Lentine, Robert M. Perkins & Kevin C. Abbott . 51 The early course: induction, delayed function, and rejection. Bengt C. Fellström, Alan Jardine & Hallvard Holdaas . PART 9 DISORDERS OF ELECTROLYTES (ACUTE AND CHRONIC). 54 Overview of electrolyte and acid-base disorders. L. Lee Hamm & Michael Haderlie . Chukwuma Eze & Eric E. Simon . John R. Foringer, Christopher Norris & Kevin W. Finkel . 57 Metabolic evaluation and prevention of renal stone disease. Themes across renal disease and renal failure. 58 Growth, nutrition, and pubertal development. 59 Hypertension, cardiovascular disease, and lipid abnormalities in children with chronic kidney failure. Elke Wühl & Franz Schaefer . 60 Bones across kidney disease and kidney failure. Susan Furth & Sandra Amaral . Pierre Cochat & Justine Bacchetta . 63 Peritoneal dialysis in children. Jaap W. Groothoff & Maruschka P. Merkus . 65 Urinary tract infection, vesicoureteric reflux and urinary incontinence. Gabrielle Williams, Premala Sureshkumar, Patrina Caldwell & Jonathan C. Craig. 66 Epidemiology and general management of childhood idiopathic nephrotic syndrome. Nicholas J. A. Webb . 67 Management of steroid-sensitive nephrotic syndrome. Elisabeth M. Hodson, Jonathan C. Craig & Narelle S. Willis. Annabelle Chua & Peter Yorgin. Other pediatric renal diseases . 69 Henoch-Schonlein nephritis and membranoproliferative glomerulonephristis.